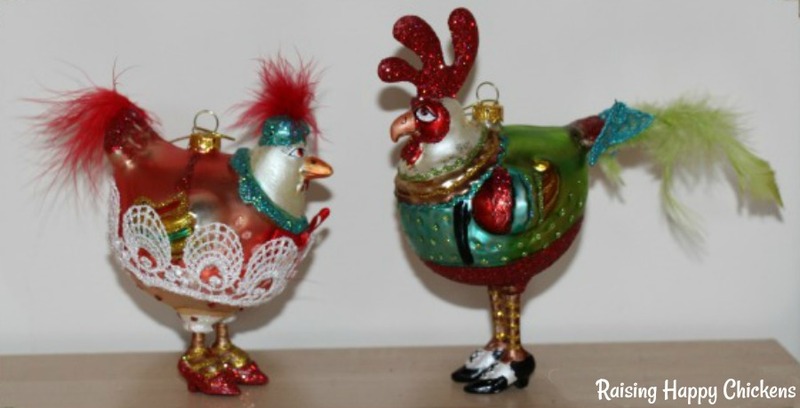 Christmas tree ornaments - with a chicken theme! Christmas Tree Ornaments with a chicken theme! Let me guess: you love chickens, and you love a bit of sparkly magic at Christmas - right?! So if that sparkle comes in the shape of a chicken or two - so much the better! You're in the right place. I started collecting chicken-themed Christmas tree ornaments several years ago, so I know what's available out there. And we're not talking about modern plastic imports. I'm here to tell you where to find some of the classiest - and funniest - chicken Christmas tree decorations out there. They're the kind of ornaments you can give to younger family members who love chickens and have just set up home. Often at that stage, they can't afford to buy the more expensive ones for themselves. So these all make wonderful, unique, Christmas gifts. Look on them as heirlooms. You'll be contributing to family traditions for many years to come. Firstly - keep an eye open locally. Sadly, I can't find these online. But I can find all these below. They're available from Amazon - click on any of the pictures or the links to buy. But be aware that these always sell out well before Christmas. My advice so as not to be disappointed is to buy them in November - at the latest. Patience Brewster's "Three French Hens". Click on the pic to buy. This decoration is currently sold out - more are expected from Patience Brewster in mid November 2018. Come back here then for more information. To buy this tree decoration, click on the image or on this link now. This is one of my favourite of all tree ornaments with a chicken twist. It's a fun, whimsical twist on the "3 French Hens" part of the Twelve Days of Christmas. If you don't know Patience Brewster's work, it's worth looking at. Hers is a small, one artist business. All the items are unique designs by Patience herself, and are hand made and hand painted. 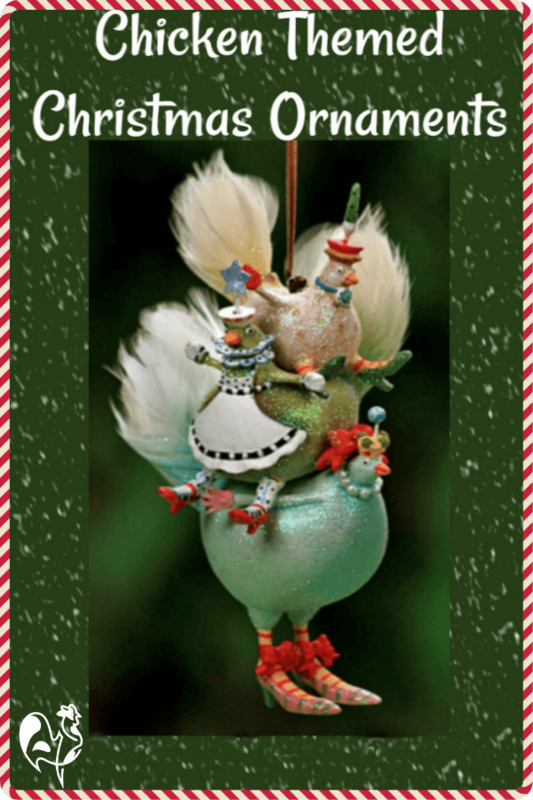 The "3 French Hens" ornament has the hens teetering in heels and dressed in appropriately sparkly attire, fluffed out with feathers. It's made of a resin, which means it's virtually unbreakable, and comes in a presentation box. It would make a beautiful heirloom gift for younger family members, or buy it for yourself to pass down the generations! I loved it so much that, although it can't be bought in Europe, I contacted the company direct and asked them to send me one by special delivery. It wasn't cheap, but it was so worth it! If you're in the US, you don't have to go to those lengths. Just click here to buy. 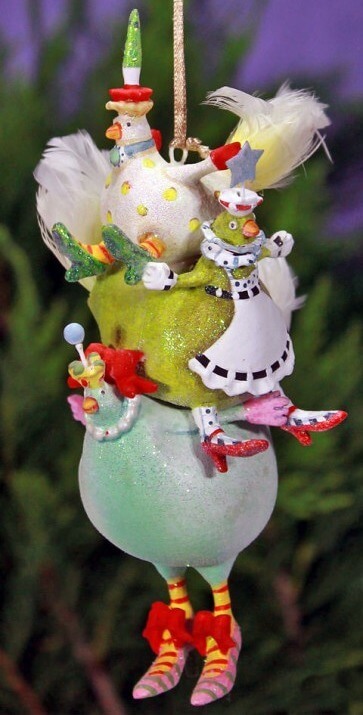 "Old World" hen on nest glass Christmas tree ornament. Click to order from Amazon now! The second favourite of my chicken-themed tree ornaments. 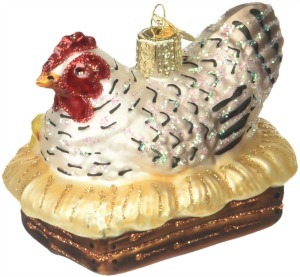 If you like Christmas, you like chickens and you like a bit of sparkle, this fun tree ornament is definitely for you. It's from the well-known and very well-made 'Old World' collection. This small company makes authentic, an old-fashioned glass ornaments - no plastic anywhere in sight!. This is another one of my favourites which I ordered from America just because I love it so much. It's got that lovely sheen of antique-style tree ornaments - and of course it has some sparkle too. It comes in its own little gift box so it makes an ideal - and inexpensive - Christmas gift. The "Old World" collection features quite a lot of chicken- and homestead-themed ornaments - so much so that I've written a whole article devoted to them. You'll find it at this link. Jim Shore Santa - with rooster! 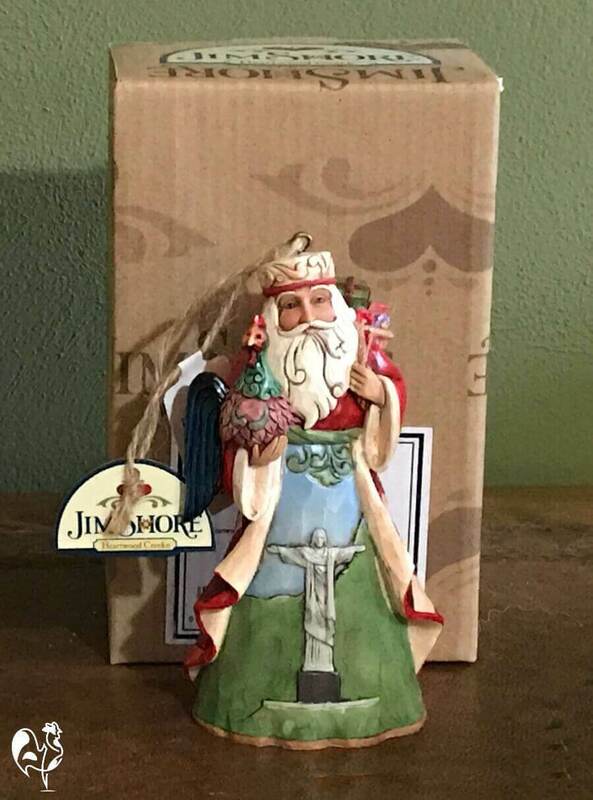 You probably know Jim Shore - he produces the most beautiful, detailed range of Christmas-themed decorations. I have (and love) his Italian Santa figurine. 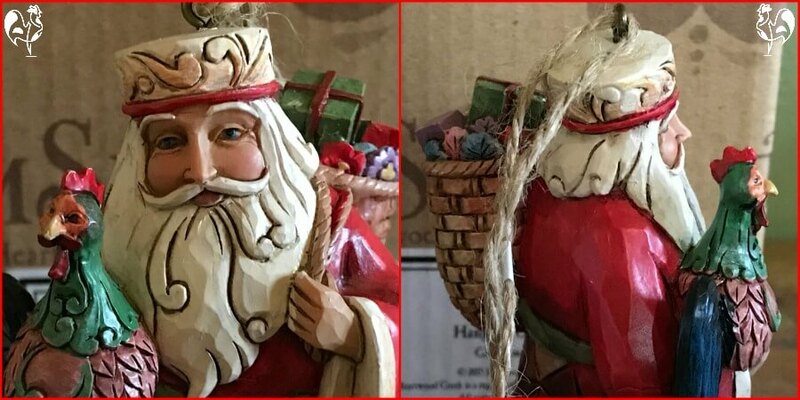 And just this year I discovered his Brazilian Santa, from the Heartwood "Santas Around the World" collectibles group. I chose the smaller Christmas tree ornament this time, and I wasn't disappointed. Made from stone resin, like his other designs this one combines the traditional with folksy artwork. Having a Brazilian theme, it features the well-known Christ the Redeemer statue of Rio in Santa's skirt. Because in Brazil, Midnight Mass is known as the "Missa do Galo" - Mass of the Rooster - because it finishes at the start of a new day. And, as we all know, the rooster crows to welcome in that new day. I genuinely love that connection. It's actually not easy to find - it's not featured on his own website now and it may be that it's being "retired". It comes in two sizes. I have the smaller Christmas tree decoration, and it's also available in a larger stand-alone ornament. Both come in their own gift box. "Committed to bringing joy every day" is the slogan of the company which works with Jim Shore to produce these. I'd say they've definitely succeeded with this one. Wouldn't you? 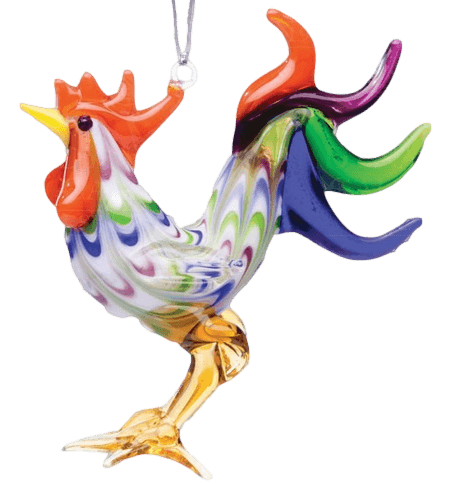 A colourful glass rooster to wake you on Christmas morning! Click on the pic to buy it now. Got a favourite roo, or know someone who has? You may have just found an ideal Christmas gift for them! If you prefer something a little less glittery than our "hen on a nest" and rather tasteful (I like tasteful and glitter!) 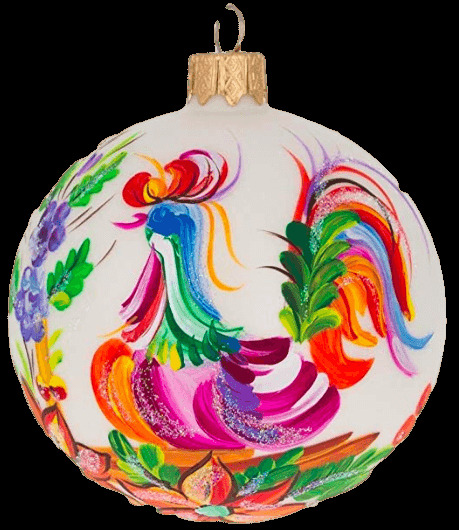 this hand-painted glass ornament may be just what you're looking for. It's just beautiful workmanship. It's presented in a good quality box and it makes a wonderful gift for the younger people in your family who either love chickens, or who know you love chickens and would want to remember you by this gift. Feedback emphasises that the colours are much more vibrant than the image shows - there are no poor reviews about this ornament. It's not only a Christmas gift, either - there's nothing specifically "Christmassy" about it. Know anyone who was born in the year of the rooster? This gift would make an absolutely perfect birthday gift for them! Hand painted rooster tree ornament. This has to be one of the prettiest chicken-themed Christmas tree baubles I've seen. It's designed in America but hand-painted in the Ukraine, and available in both the US and UK. It combines elegance with glitter - the glitter's not overdone, just enough to make it sparkle under tree lights. Like the "Old World" ornaments, it's glass, not plastic, and uses traditional European methods to create each one. As each bauble is hand-crafted and hand-painted, each is slightly different. It comes in its own gift box complete with a ribbon for hanging and it makes an ideal Christmas gift for chicken-keepers - or anyone who just loves chickens. I loved it so much I bought one for my sister, too! Still not found quite what you're looking for? Here are a few more chicken tree ornaments I've found for you. These are not ornaments I have first-hand knowledge of (which is why I haven't featured them on the main page) but they're gorgeous, and they all have good reviews on Amazon. Just a word of warning - from my own experience, chicken-themed Christmas tree ornaments tend to sell very quickly. Don't leave it too late! 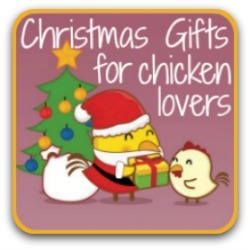 Looking for some other inexpensive Christmas gift ideas for people who love chickens? Because I'm always on the lookout for chicken-themed gift ideas for myself, I have a lot of ideas for other people too! If you're looking for an inexpensive gift to give a chicken-addict this Christmas this page might give you some ideas. Just click on the pic.